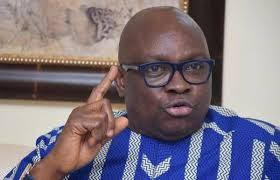 The outgoing Governor of Ekiti State, Ayodele Fayose, has accused the Economic and Financial Crimes Commission of shopping for evidence to nail him. Specifically, Fayose in an October 10 letter addressed to the Acting Chairman of the EFCC, Ibrahim Magu, and sighted by The Punch, alleged that the commission had invited one Maroun Mecheleb in order to mount pressure on him so as to make a false statement to implicate him. He said the intention of EFCC was to concoct charges against him.